Sciblogs | An extragalactic mystery: Where do high-energy cosmic rays come from? New findings from the IceCube Neutrino Observatory at the South Pole have brought us closer to understanding the origin of these strange ’rays’ — charged particles that originate somewhere beyond our planet and that reach Earth with varying energy levels and in different forms. 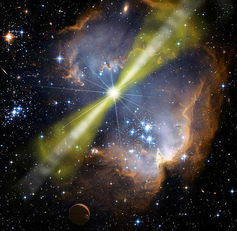 A recent announcement by IceCube scientists suggests the newly constructed observatory has found evidence allowing them to rule out gamma-ray bursts — the most energetic explosions in the known universe — as the most likely source of the highest-energy cosmic rays. This is big news, make no mistake. But to understand the significance of this finding, we first need to take a look at the history of cosmic-ray research. 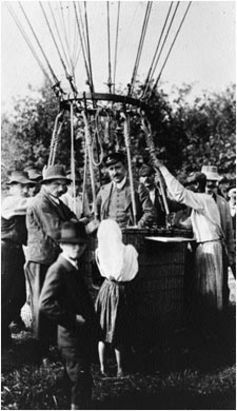 Some 100 years ago, the pioneering Austrian physicist Victor Hess jumped in a hot-air balloon and climbed to the dizzying height of 5.3km above the earth’s surface. Why? Because he, as with many scientists of his day, was wondering where exactly ionising radiation was coming from. Ionising radiation is comprised of particles that can react with matter; radiation such as that seen in the fallout from the Fukushima nuclear disaster. Hess’s major achievement was to show that as altitude increases, so do the levels of ionising radiation — and so the radiation must have been coming from space. This radiation was thus given the title ’cosmic rays’ and Hess was awarded the 1935 Nobel Prize in Physics for his troubles. Ever since, scientists such as myself have been wondering where these cosmic rays actually came from. While we are still in the dark about some major aspects of the origins of cosmic rays, we’ve made considerable progress. We know cosmic rays are made up of charged particles: primarily protons (roughly 89%), helium (roughly 9%) and electrons (roughly 1%) with heavier elements (up to iron) making up the other 1%. 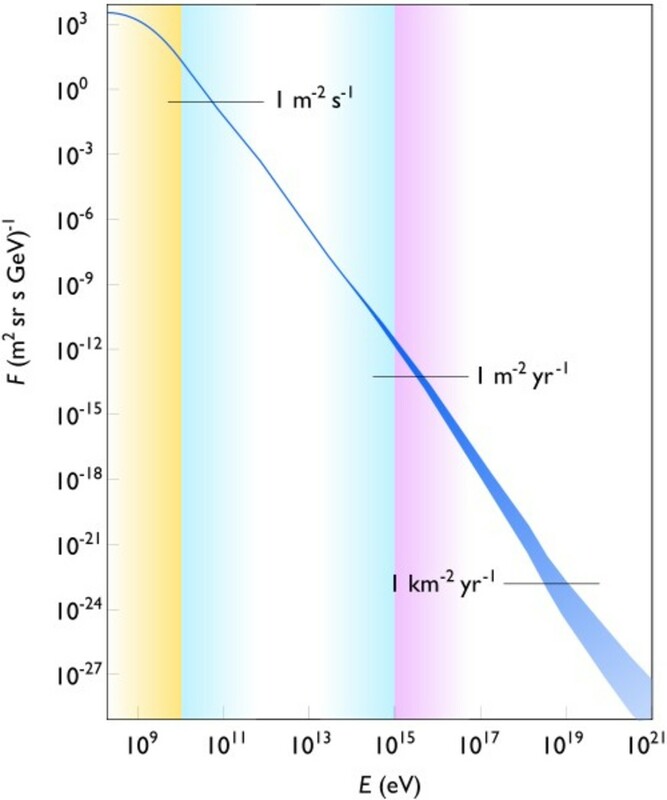 We also know cosmic rays arrive at Earth with an impressive energy range: from millions of electron volts — an electron volt (eV) is the amount of energy gained by the charge of a single electron when it is moved across an electric potential difference of one volt — up to more than 1021 eV (the number 1 with 21 zeroes after it!). These 1021 eV particles are the most energetic particles ever observed — subatomic particles with the energy of a vigorous tennis serve! 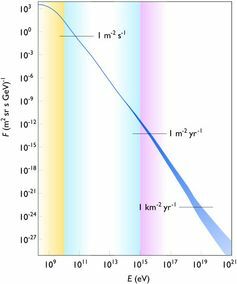 Given the huge energy range with which cosmic rays arrive at Earth, it seems clear we need several explanations for their origin. The sun supplies many of the low-energy cosmic rays seen on Earth, while sources within our galaxy probably make up most of the rest. The cosmic rays at intermediate energies are probably created through the explosion of dead stars (known as supernovae), their remnants and other detritus from their lives. But there are still large gaps in our knowledge. There is precious little evidence about the exact site(s) of cosmic-ray acceleration — cosmic rays being sped up to extremely high energies — above what the sun or the Milky Way can produce. At modest energies, there is very good evidence — from X-ray and radio telescopes — that the remnants of supernovae can accelerate cosmic-ray electrons. But we still have no strong evidence where cosmic-ray protons, which, you’ll recall, make up roughly 90% of cosmic rays, are accelerated, even in our own cosmic backyard. And even after a century of intense study, we still don’t know the exact source of the highest-energy cosmic rays; subatomic particles with energies above about 1015 eV. These particles are found above what is known as the ’knee’ of the cosmic ray spectrum (see image above) and are thought to come from extragalactic sources. So, how do we go about determining the source of these high-energy cosmic rays, observationally? There are two methods: direct and indirect detection. Due to the fact cosmic rays are made up of charged particles, they are — unlike photons (light particles) — deflected by ambient magnetic fields. As a result, the exact location of their acceleration is lost. But the relative weakness of galactic and intergalactic magnetic fields implies this does not occur for sufficiently energetic cosmic rays — rays with energy levels above 1019 eV. Thus it was a great breakthrough in 2007 when the Pierre Auger Observatory — a vast array of tanks and fluorescence (light) detectors dedicated to directly detecting cosmic rays at the highest energies — reported there was a statistically significant correlation between cosmic rays and active galactic nuclei — the centres of galaxies which contain supermassive black holes. In other words, it appeared as if high-energy cosmic rays were coming from active galactic nuclei. Unfortunately, this evidence is getting worse. While scientists at the Pierre Auger Observatory were sure their data were correct and their result was statistically significant, in statistics, nothing is certain. A small number of results will actually be a meaningless blip and, unfortunately for the researchers at the Pierre Auger Observatory, this result was one of them. Their signal is, sadly, disappearing into the statistical muck of random noise. Therefore, for now, we need a non-interacting proxy for detecting cosmic rays: the neutrino. Neutrinos are almost-massless, charge-less particles (their name means ’little neutral one’) which are created in many particle interactions. You might remember that neutrinos were at the centre of the faster-than-light kerfuffle earlier this year. The neutrino’s lack of charge and mass, however, makes them incredibly difficult to detect and as a result, neutrino detectors have to be enormous. 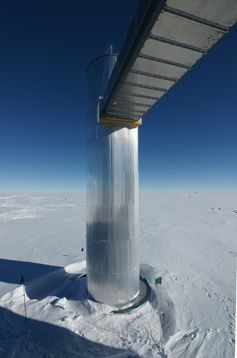 As it turns out, one of the best detection mediums is the ice of Antarctica and so, to detect neutrinos from outer space, the one-cubic-kilometre IceCube observatory was built at the South Pole. For the vast majority of the past century, without enormous detectors such as IceCube, the only source of information about the acceleration of the highest-energy cosmic rays was purely theoretical. Many of these theories have posited that mysterious bursts of gamma rays (photons with very high energies), called gamma-ray bursts, could provide a meaningful flux of particles at the highest energies. Gamma-ray bursts, the most energetic events in the known universe, are observed at a rate of a few per galaxy per century. They last from milliseconds to minutes and are followed by afterglows emitted at X-ray to radio wavelengths. Despite their rarity, the vast expanse of our universe makes (or according to IceCube’s current research, made) these events a great potential source for the highest-energy cosmic rays. We know that neutrinos are produced in the same interactions that should produce the gamma rays that give gamma-ray bursts their name. Hence, the theory goes, neutrinos should be observed from gamma-ray bursts. Given this, it leaves particle physics in a precarious position, given that neutrinos from these gamma-ray bursts are not seen by IceCube. There are two schools of thought about the sources of cosmic rays at the highest energies. Either they’re created bottom-up — accelerated from lower energies, such as in gamma-ray bursts — or top-down — where more-energetic particles interact in some way and lose energy, creating cosmic rays. Top-down models usually posit the existence of exotic dark matter particles (although recent results suggest that even dark matter is not on as certain scientific footing as it once was). The crux of the problem, really, is that other than active galactic nuclei and gamma-ray bursts, there are no known, credible sources that are abundant enough to create these high-energy cosmic rays. This fact leads us to a startling conclusion: either the IceCube data is wrong (as with the Pierre Auger Observatory results, we might have seen a random fluctuation of the data masquerading as a statistically significant result), our understanding of gamma-ray bursts is wrong, or we have to appeal to a completely new paradigm of physics. In this new paradigm, cosmic rays at the highest energies might be created by unknown particles, (possibly) under the influence of novel particle physics. This could lead to this century’s Albert Einstein or Victor Hess showing the rest of us what we’ve been missing this whole time. One thing’s for sure: this is a very exciting time to be a particle physicist. More information from the electric universe line of thinking about the Gamma ray burst. Seems they were right about comets being rocks and the science around GRB sounds pretty good to me.